But the desire to design workspace that are efficient and inspirational remained strong. And in 1999, a rising film company built a new headquarters, proving again the right work environment can make all the difference. The story behind Pixar’s headquarters starts in 1999 with Steve Jobs. As Pixar’s CEO, Jobs brought in Bohlin Cywinski Jackson — famously known for designing Bill Gates’ Washington residential compound — to flesh out his vision for the campus, which was planned to hold up to 1000 employees. Pixar’s campus design originally separated different employee disciplines into different buildings — one for computer scientists, another for animators, and a third building for everybody else. But because Jobs was fanatic about these unplanned collaborations, he envisioned a campus where these encounters could take place, and his design included a great atrium space that acts as a central hub for the campus. Today some of the most influential companies in the world — Apple, Facebook and Google — have built or are building massive headquarters that are also designed to foster interaction and collaboration. And like other tech sector habits, the trend has taken off in other industries; and estimated 70 percent of U.S. workplaces have adopted open-office environments. In many cases, increasing “serendipitous innovation” is the stated goal. But most of these companies aren’t building new headquarters — they’re reorganizing existing offices by removing cubes and converting offices into meeting rooms. This, coupled with rising real estate prices and corporate cost-cutting, has put the squeeze on personal space in the office: the per-employee average in North America dropped from 225 square feet in 2010 to 176 square feet in 2012. The inevitable backlash started, or picked up momentum, in January 2014, when The New Yorker published a detailed take-down of the trend. The article includes links to numerous studies and surveys, all of them finding that the benefits of an open office are at least balanced, and often outweighed, by the downsides. And the griping has continued unabated. The most common complaint has been about distraction. “On the first day, I took my seat at the table assigned to our creative department, next to a nice woman who I suspect was an air horn in a former life,” wrote one ad agency veteran whose office embraced the trend. The publishing company Hachette is battling ambient sound by piping “pink noise — white noise that has been set to the frequencies of human voices — through a system of overhead speakers.” Designers of office furniture are now offering “privacy pods” in a range of styles. They’re an elegant but pricy solution to the problem that companies created by rushing headlong into the open office trend. Commercial insurance company Zurich North America “committed to a full exploration of the firm’s culture, aspirations, values, brand, current work realities, and future work aspirations on every level” before renovating its office space. But Zurich seems to be an exception. The studies and surveys we’ve read have had little or nothing to say about the roles corporate culture and mission play in how well an open-office environment works for a given organization. We’ve written before about how culture influences workplace creativity, for better or worse. Tearing down walls and reassigning seats won’t make your organization more nimble or innovative if other barriers remain in place. 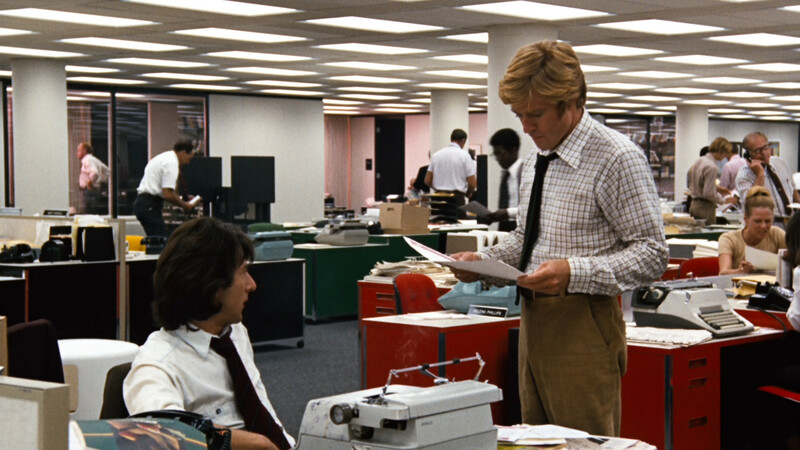 Traditional newsrooms — like the Washington Post’s as depicted in All The President’s Men — were cavernous, densely packed and relentlessly noisy. But they suited the industry; the buzz of activity is conducive to hitting daily deadlines, and reporters weren’t supposed to spend much time at their desks anyway. Reporters are hunter-gatherers. But many industries are more like farming, with employees working in one place all or most of the time. How much do those people really benefit from sharing long tables all day? Or from jockeying to secure one of the few quiet, private spaces? In their eagerness to tap into the power of collaboration that Steve Jobs celebrated, many corporate leaders have forgotten the other word he used: unplanned. And collaboration is not unplanned when you reorganize your office into one massive conference room and turn every workday into a never-ending brainstorming session. Constant distractions erode creativity, the very thing that open environments are supposed to promote. The chance encounters that Jobs so valued occur not just between people, but within minds. “At any given moment,” writes Jonah Lehrer in Imagine: How Creativity Works, “the brain is automatically forming new associations, continually connecting an everyday x to an unexpected y.” But as he goes on to explain, these associations adhere to their own schedules, often popping up when we’re doing something totally unrelated to our most pressing work-related concern (like showering). To arrive at clever solutions, we need stimulation and quiet, collaboration and separation. Pixar’s success was very much on our minds when we established our Innovation Center in a grand former church in 2005. The space is magnificent, featuring a soaring central dome that’s inspirational all on its own. The layout is somewhat warren-like, and the route from one point to another can feel rather circuitous, but that’s how chance encounters occur. There are few walled offices and many meeting rooms, but our designers and engineers also have their own spaces where they can minimize visual and aural distractions and focus on individual tasks before and after team meetings. The environment inspires reverence for all facets of the creative process, from the noisy to the subdued. Our workspace inspires our creativity. We believe wholeheartedly in the value of collaboration — it’s been the foundation of our success for more than 40 years. And if there were a shortcut to promoting it, we would have found it by now. Focusing on your physical environment, to the exclusion of other factors, won’t get you closer to realizing your true potential than any other management fad ever has, and in fact it could set you back. Study what others have done, think long and hard about what would suit your organization’s mission and values and what wouldn’t, and design accordingly.